Some SAP systems can take up to 10 days to complete a SAP system copy. That’s 10 days of unproductive time. Why? SAP does not provide the necessary tools out-of-the-box to automate and handle the process efficiently. This means you must use highly skilled SAP BASIS staff to manage the process. Manual steps, along with hundreds of configuration settings, can take days to complete—and like many organizations, you have also experienced too many delays, causing non-production systems to be unavailable, which stalls development, testing and training activities. So you’ve concluded your SAP system copy process is hindering innovation and productivity. You’re considering automating the process to ensure system copies are available for all environments on time, every time. 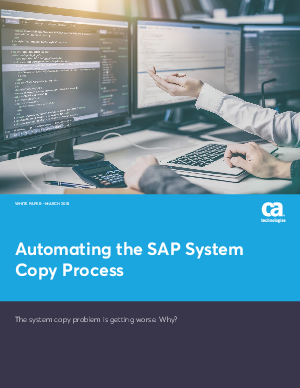 What are the key capabilities you actually need to address SAP system copy inefficiency once and for all? To help you, we’ve collated the top requirements during the past 10 years from global enterprises that have successfully automated over 90 percent of their system copy process and are making system copies twice as fast—with 90 percent fewer resources. For them, system copies are available for all environments on time, every time, leaving testing and development work almost uninterrupted.